This is the video I placed with Daria’s recording. How it should be viewed it in a dark quiet room so you concentrate on the clouds and the recording along with it. 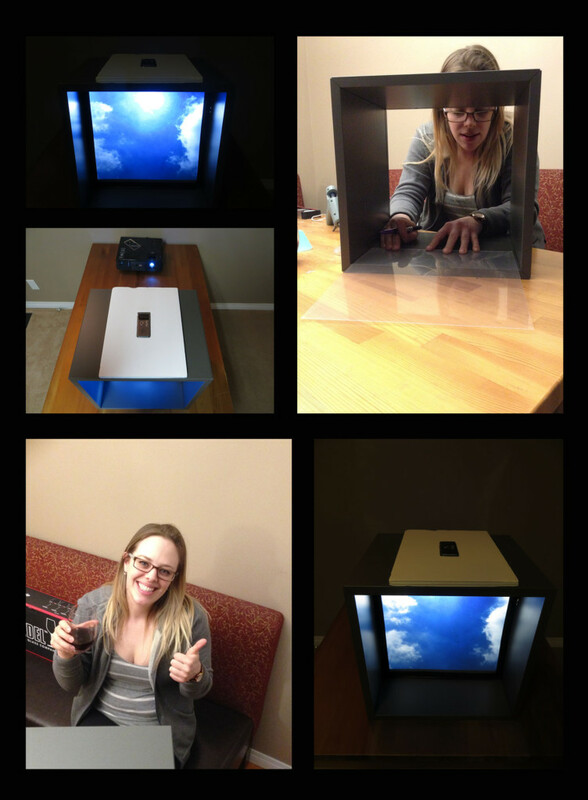 How I displayed it to finish my piece is I projected the video and audio through a box. Which looks like the image below. I was pretty thrown by what Daria sent me for BLUE 5. I went to Canada Post to pick up her package. I got back to my car and opened it immediately. What I found was a recording device in a foam board. I took out the recording device and followed the direction so I could listen to it. I was clueless what to do with this recording. I am comfortable with two-dimensional visual artwork but when given a conceptual audio file threw me into new territory. I took the recorder and showed it to a lot of my friends and co-workers and hope someone would inspire me to create something. After a couple days of listening to the device, I decided to write down the lyrics. This helped me decide what word to pick for my BLUE 6. After reading and listening to the lyrics many times…and then a few times again after that, I decided that the meaning had to be something more abstract like and emotion or something spiritual. Eventually I decided on IMAGINATION as my word. The clouds are a play on the imagination but can also be seen in a relaxing or spiritual way. As kids (and adults) look up at the sky and clouds sometimes you can see shapes and objects using your imagination. So when you are watching my video I want the viewer to be listening to the audio and letting their creativity take over the clouds. Like the poem, I believe our imagination is always “with” us, whether we use it a little or a lot. Your imagination is an important tool in your everyday life, whether you are solving a problem or creating artwork. 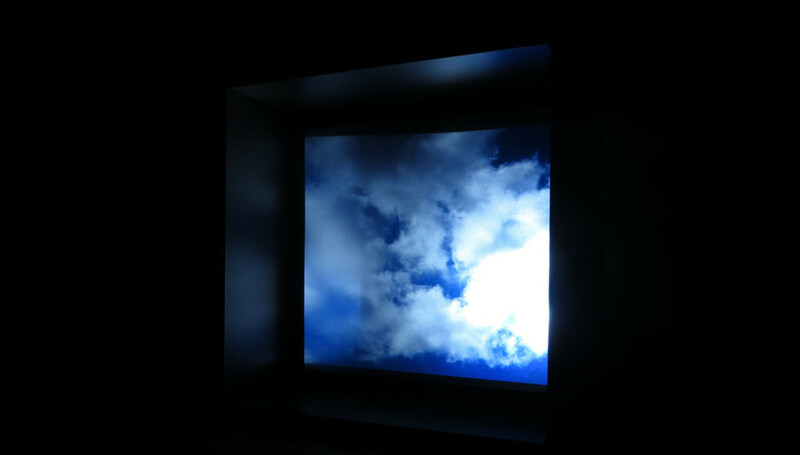 This project has as much to do with the video as it does with the experience you get when you view it through the projection box. If we were to do a show for 7030inbetween, this would be an installation piece.